S. Preston answers this week’s 20 Questions instalment. 20Q profiles bloggers, creators, artists, inspiring people, innovators, philanthropists, and entrepreneurs. Don’t miss these past features. Usually the best way to meet good people is through other good people, and that’s exactly how I met Preston. We were online buddies before taking our friendship offline when Rebecca and I visited Southern California in August. Preston was the consummate host, ensuring we had a true local experience – complete with great Mexican food and strip mall foot massages. I was blown away to learn that his nickname was inspired by none other than Bill S. Preston, Esquire (if we’re friends, you know how obsessed I am with Bill & Ted), but I was even more impressed by the person I got to know. 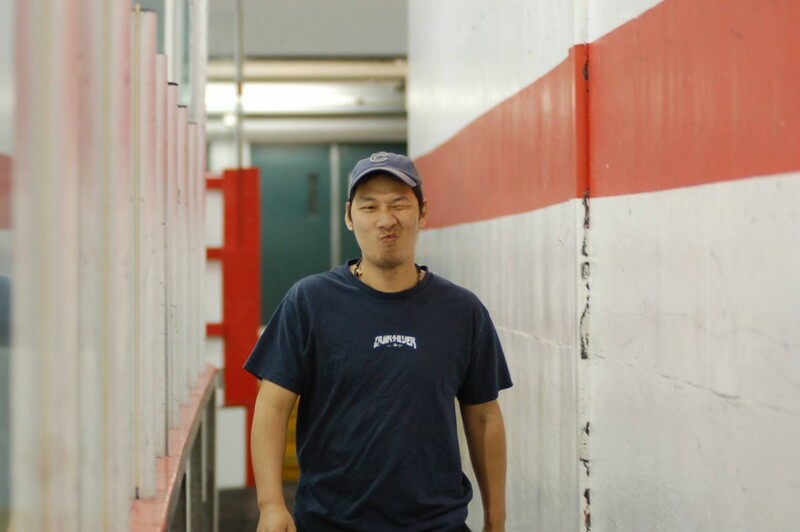 Kind, funny, and hard-working, I’m honoured to call him my friend. 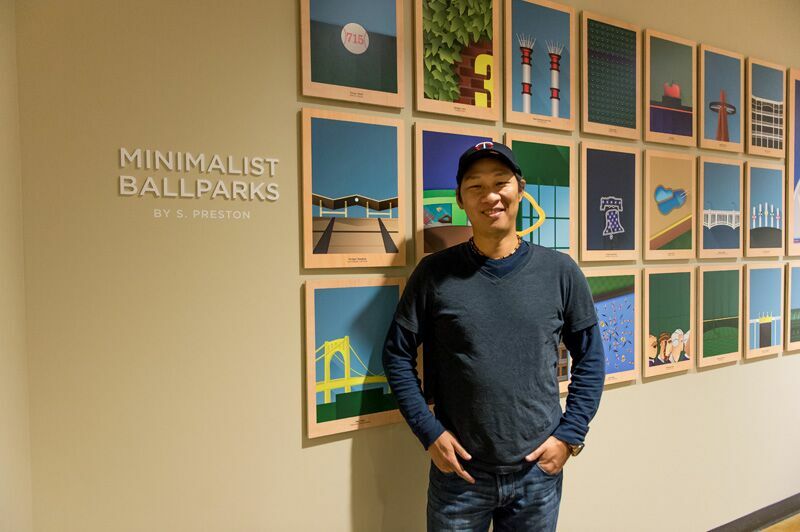 You may know him as the artist behind the MLB-licensed Minimalist Ballpark series of prints and the on-the-fly sketches of Ballpark Princesses that he draws at stadiums across America. A Canadian transplant living in SoCal, Preston is not only a super-talented artist but also a go-getter, hockey player, brother, traveller, Disney fan, and apparently one heck of a camp counsellor in his day. Today he answers 20 Questions for you! I’m really excited about drawing. I’m always excited to draw! I’m primarily a digital artist, but up until my teenage years, I always had a pencil and I was always drawing. Then all of a sudden I stopped for 20 years. I now bring a sketchbook everywhere, and that muscle memory has returned! 2. What was the last thing you drew free-handed? The last thing I drew was a Ballpark Princess of course! People ask me to draw other things, but I draw for myself – not for others. The Ballpark Princess series is entirely a personal project and I actually don’t care if anyone likes them or not. I think it’s great that other people love them though, and I love meeting new people through my baseball art. On my computer, I just finished illustrating Arrowhead Stadium in Kansas City and Nordy – the Minnesota Wild’s mascot. 3. Making yourself and your art accessible through social media opens the door to admiration but also criticism. How do you handle criticism? This is the strange thing… I never really get criticism. I would only say I have had two or three really negative comments in the past three years, and they were mostly just trolling me. I’m sure that’s not normal. I like to think it’s because I make a point of caring for all fans, and never putting their team down. Art is about sharing the love, and bringing hate into the conversation only take away from my art. So I guess I’m saying, if you share the love, you’ll get that love back. 4. The art you create is entirely unique. Your minimalist ballparks are incredible and I’ve never seen anything else like the Ballpark Princess series! What was it that initially inspired you to go in this direction? I love clean design. I love sports. It took me 40 years to put them together! I sometime feel like it’s a happy accident, but it’s really just a life journey. There was a moment in my life when I decided to stop leading my life with my brain, and started leading my life with my heart. It was about a year later that everything took off. Check out S. Preston’s interview with Fox News San Diego! 5. Not many people can say they’re in the Baseball Hall of Fame. That’s a pretty admirable accomplishment! What’s something you aspire to that might surprise people? First let’s sink that in a bit. My artwork is preserved in the archives of baseball for all time. I never thought that anything I created would last longer than my lifetime! Anyone who knows me, knows I give a lot. I give my time and I give my art and I give my money. Though I put other people first a lot, it’s not because I don’t care about myself. Inside, I aspire to be great and I’m driven to succeed. I believe that the path to greatness is by bringing up everyone around me. “You need to give to be great.” That’s one of my mantras I live by. Not the princess obviously. Hahaha! I would say the brainiac and the jock. I got straight A’s and never studied. I played every sport and was the captain on most of them. So added with my artistic skills, I was that guy at school. That’s a tough question. Funny enough, my business partner and I ask this question all the time to each other, as a way to keep looking into the future. I think I would love to have my own gallery. 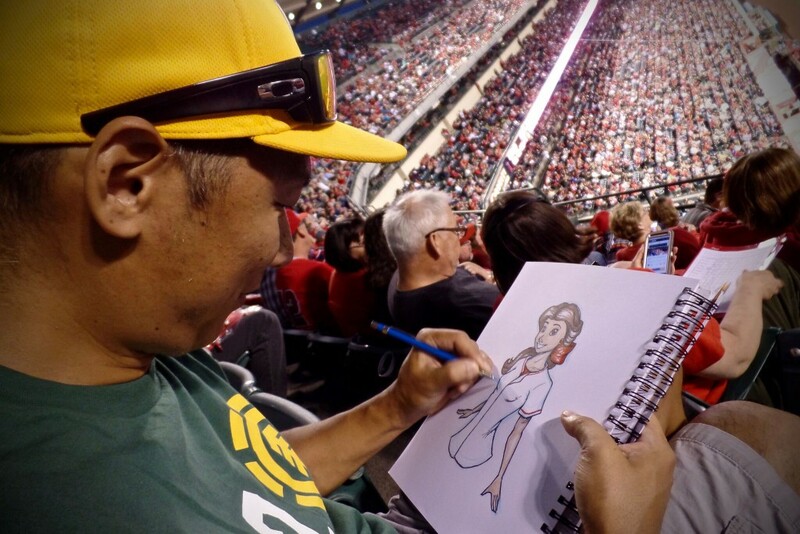 Even if it’s just for one year, I’d love to display my artwork in real life to baseball fans. 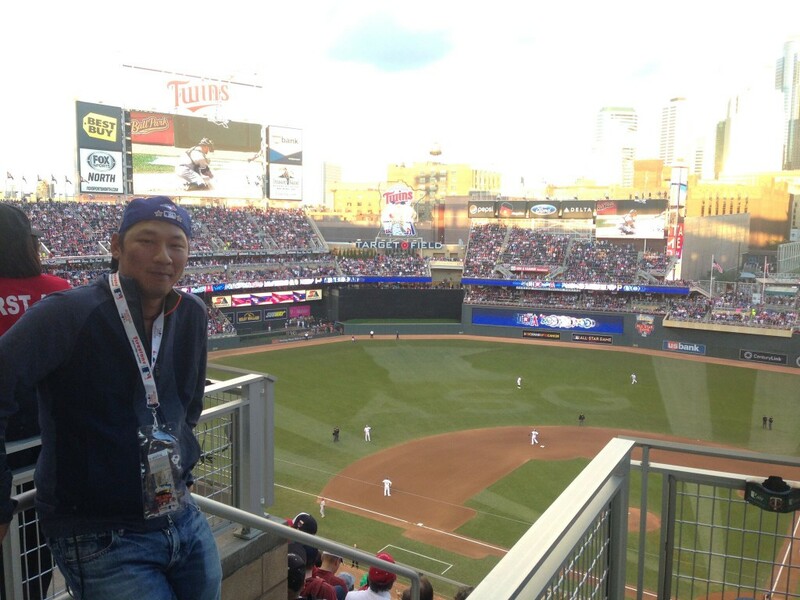 Maybe even a traveling gallery, going from ballpark to ballpark. That would be amazing! Artwork looks so much better when it’s not on a computer screen. 8. Who’s your all-time favourite baseball player? I’ve never gone ga-ga over celebrities. The more famous people I meet, the more they are just regular people that are really, really good at their job. So I always tell people I don’t have any sports heroes, except one: Jim Abbott. Jim Abbott was a Major League pitcher who was born without a hand. He pitched the gold medal game at the ’88 Olympics, and pitched a no-hitter with the Yankees. I idolize him for the perseverance and determination to overcome his handicap to become great. I don’t care about signatures, but I only have one signed baseball and it has Jim Abbott’s name on it. I was once a guy who just floated along… talented enough, but never really accomplishing much. Then I came across another mantra: “A fool with a plan always beats a wandering genius.” So I started thinking, what about a genius with a plan? (I’m no genius but I’m no fool either). That changed my life! So back to your question. There’s only so much time and so much art that a person can make. The strength of my business is the sports licenses and relationships I have throughout the art and sports world. I would love to leverage these and help bring more artists under my license and grow my studio as an aggregator of great sports art. I don’t drink and when I do I drink beer. So hit me up with any local craft beer. 11. It’s now 2:00 a.m. and I’ve served you half a dozen craft beers. Where are you going for your greasy food fix? 12. In Orange County, what’s the one restaurant that no one has heard of but everyone should eat at? People think I’m gay. I’m single and in my 40s. I’m an artist. And I draw Disney princesses. So basically I’m single because I have a trapped heart. I’ve only been an artist for a couple years. And I draw Disney princesses for my own reason but not because I want to be one. For me to be gay would be terrible because women are so awesome! There’s an anime series called Major. Season one starts with kindergarten-aged Goro Shigeno, whose father was killed by a fastball by an arrogant American Major League pitcher. Goro vows to avenge his father by being so great at baseball he will make it out of Japan and challenge his father’s killer in the majors. It’s six seasons long and he doesn’t even leave high school till after the third season! It’s an amazing story how talent alone is not enough. Goro had to work every step of the way. It’s a path every professional athlete has to go through. So yes, I want to be Goro. I even wear his number on every jersey I wear (56). I wish I knew languages. I can speak a bit of French and Korean, but not enough to get by. Other than education, knowing more languages can get you really far in this world. Figuratively far and literally far. This is interesting, cause I’m kinda proud of everyone around me. Another mantra I live by is, “it’s not me, it you.” What I mean is that I stopped seeing my mother as my mother and started seeing myself as her son. I don’t see him as my friend, but I’m his friend. Using that, I started looking at people differently, and at myself as “proud to be.” Proud to be an uncle. Proud to be a friend. Proud to be a brother, etc. If I’m not “proud of” to be that, I don’t need them in my life. Easy question. It’s my brother. He’s dragged me into so many things and if I never did, I would never excel at it! He made me play hockey with him. He made me draw with him. Almost all the experiences I’ve had were because I was following him around. In fact, the big reason I have all these mantras and I moved to LA is the need to find my own path and not be always under his shadow. If I were to invite three people, I would invite Roberto Clemente for sure. Jim Abbott, of course. And heck, Alicia Silverstone can come too. I never thought about this before. Good question! If there was ever a biography about me, there is one question that surrounds me and drives me. Unfortunately I’m not ready to disclose that question, because I’m not ready for that answer. Similar to my “wandering genius” mantra, I will say, there’s a good feeling that I know the question I ask and the answer I seek in my life that drive me everyday to move forward. All photos are provided courtesy of S. Preston.